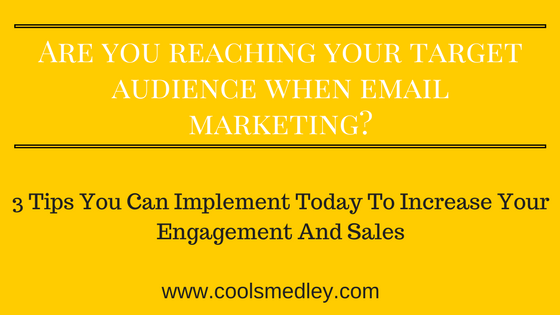 Are you reaching your target audience when email marketing? If you’re like most of us, all of the marketing strategies can get overwhelming. Although SEO, PPC, content marketing etc. is extremely important; email marketing is the foundation for nurturing your relationship with prospects and current clients. Email marketing is not any different than other types of marketing. This means the basic principles of marketing apply to your email marketing efforts as well. One of these most important principles is the importance of reaching your target audience. The ability to reach your target audience and convince them to make a purchase cannot be underestimated. I want to provide some insight into how businesses can effectively reach their target audience. The simplest way to reach your target audience is to allow existing customers as well as potential customers to register on your website and decide whether or not they want to receive emails with additional information and advertisements. When the users register they should be required to enter an email address. This registration process will allow you to compile a list of email addresses from each potential customer who expressed an interest in receiving additional information. Sending your email marketing materials to the members of this distribution list is much more effective than sending out a mass email to recipients whose email addresses you purchased. This is because the group of email addresses you compiled all have an interest in the products or services you offer while there is no information on the other set of email addresses to indicate whether or not the members will even have an interest in the products or services you offer. Another tip for reaching your target audience is to do adequate research to determine how to communicate with the members of your target audience. This may include changing the language of your emails to suit the preferences of your target audience members, designing the layout and colors of the email to be appealing to the target audience and tailoring the emails to include content which is of interest to the members of the target audience. This type of research can really pay off because it will make your emails significantly more effective. Still another tip for reaching your target audience when email marketing is to keep your message simple. Being subtle is important so your email does not seem like a blatant sales pitch but it is also important to present your message in a clear and concise manner which will be easily understood by the members of your target audience. If you have any doubts your target audience will be able to understand your message, you can certainly leave information for the email recipients to contact you with your questions. This interaction can prove to be extremely useful. Through these communications you can learn about the needs of your target audience and how you can tailor your email marketing strategy to meet these needs.